Every once in a while, you meet your cycling mirror image, or that is, every once in a while, you meet a cool biker mom who does all the coolest things you like to do. Well Madi Carlson is all of those things plus the December 2011 Cascade Cyclist of the Month (there should be a calendar, amirite?). And in this case, I'm just delighted that she and her boys like to play with me and mine. Friday, We went out in the windy December weather to find fun for the kids before they get wrapped up in school and work and the drudgery that will accompany them for the rest of their natural-born lives. University of Washington is a giant beautiful ghost town during the breaks and it was looking like rain so a Tour du Structures de Stationnement (Tour of Parking Garages) seemed in the offing. Before we get to the story line, I must say that Madi's bike is dazzling. She took the time to get the frame, fork, racks, and fenders painted to the same dye lot. She also has it decked out like we would all like to have. Where I have a Wald Paperboy rack for $45, she has a matching European front basket. Where I content myself with moderately functional Sturmey drum front hub scavenged from an earlier, dead-end cruiser build, she has a matching black Shimano dyno with disc brakes. Where I have brake levers scrounged out of a parts bin coming from an old Raleigh city bike, hers ergonomically fit and are machined to high tolerances, giving sure braking feel. Elegant is what she's got in spades. Just look at that jacket! Don't ever let people tell out that cycling is anti-materialist. We sure are, but we have our own aesthetic cues and trust me, I am fully outclassed. ne sais quoi that has to do with neither of us wearing day glo yellow or green nor clippy shoes. We both seem to ride every wheel turn with our lights on. You never can be too careful, well except that our kids ride in traffic with us, but seriously, do you ever have fun driving your kids around? We I sure have a fun time riding with my kids so maybe there's a secret in there somewhere. We then rode over to UW and into the parking garage under Red Square. This garage featured ramps that the kids could ride up as well as down and very few cars for the kids to have to dodge. It was also warmer than the outside air and we had a great time with it. We cruised around campus, visited the geology department to see cool rocks, rode on the top of Red Square and intimidated a BMX'er with our mad handling skilz and then ventured down through the Medical Center parking garage and on to Pizza at Furhman and Eastlake (excellent pizza, by the way). Next, we moved onto the Colonnade under I-5. Thorvald has grown into the 20 inch bike world and was in need of some gearing to make the hills around here somewhat bearable so St. Nicholas, in the form of a biking enthusiast named Brad, gave him a 2011 Scott Voltage 20 for Christmas. That same philanthropic dad, wanted him to have a good time on it so, well, we just had to try some gnarly drops with it and Thorvald is clearly up to the task. He even rode the rubber bridge and and took the long downhill with aplomb. Both kids rode up and down and I can now appreciate how useful balance bikes are for any junior mountain biker at least up through 5 years old. Kids love being able to put both feet down and can ride even the most difficult obstacles on balance bikes that were impossible on the larger, more purpose driven mountain bike. Still, Thorvald loves to ride both and Astrid (foreground) is oh so close to pedaling her own 16 inch bike. We just got her out of diapers and here we are almost to the point where the whole family pedals. I couldn't be prouder. 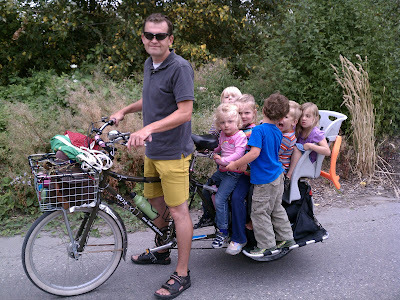 Much has been made recently by Ms. Family Ride as to a genial competition among Seattle cycling parents to either ride the furthest, heaviest, steepest, or most complicated kid/bike contraption and I rather think that she equates me as the Alpha Dog of said city/interest group. I would say no, there will always be one greater. Upon showing this photo to the boys at Surly Bicycles, they retorted "Brad, Never show that picture to our lawyers. Seriously, though, awesome." It should be noted that my kid is the one going ballistic in that photo. So when you see Ms. Family Ride out there, buy her a cup of coffee or hot chocolate and by all means, take a photo of her bike. It's the prettiest one you will ever see.